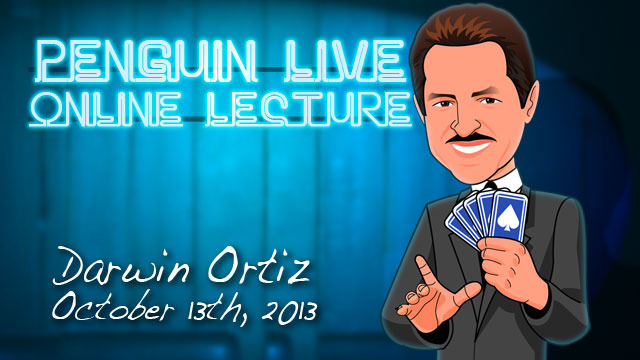 Today, when you order "Darwin Ortiz LIVE", you'll instantly be emailed a Penguin Magic gift certificate. You can spend it on anything you like at Penguin, just like cash. Just complete your order as normal, and within seconds you'll get an email with your gift certificate. 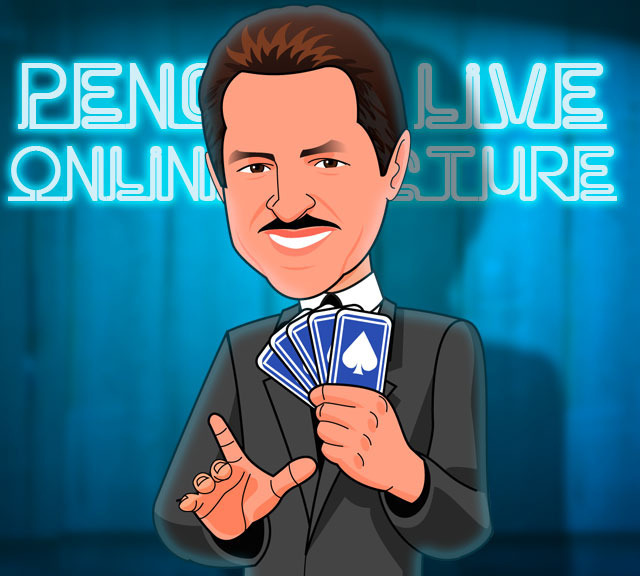 Darwin Ortiz LIVE (Penguin LIVE) Quite possibly the BEST card magician on the planet is coming to Penguin for a mind-blowing 3 1/2 hour LIVE event. SUPPORT LIVE MAGIC. DOWNLOAD THE FULL LECTURE TODAY. A true card miracle that’s virtually self-working. Yet it will convince anyone that you’re a sleight of hand master. A disarming control of any four of a kind that sneaks up on an audience to shock and overwhelm them. Then it hits them with a great kicker. The finest Texas Hold’em routine to date. It destroys Hold’em players; it destroys non-card players. A complete treatise on Vernon’s Aces, culminating in Darwin’s ultimate version of the trick. Along the way, you’ll learn tips and improvements you can apply to any version of the trick you perform. Groundbreaking concepts that can benefit anyone who employs this powerful tool. A powerful opener for any series of memorized stack effects. A great presentation and ingenious method turn an old beginner’s trick into a baffling miracle. No matter what your skill level, you're going to learn some world-class card magic from the expert who the experts trust and respect. Darwin Ortiz makes his living with a deck of cards and is recognized throughout the world as a master of sleight-of-hand and an expert on crooked gambling techniques. His corporate clients include IBM, Silicon Graphics, Aetna Insurance, Price-Waterhouse, and even the Pentagon! Darwin has appeared on over SEVENTY television and radio programs on CBS, NBC, HBO, CNN, CNBC, A&E, USA, TLC (and a few of other combinations of letters too). 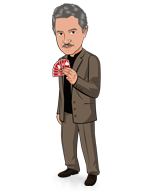 He has also been featured on both America's Most Wanted and Britain's Most Wanted...as an expert on card cheating, not as a fugitive! Mr. Ortiz frequently conducts seminars for casino gaming management and police agencies including the Division of Gaming Enforcement in Atlantic City, and the LAPD, for whom he made a training film on the subject of crooked gambling. All that to say this, when Mr. Darwin Ortiz teaches you something with a deck of cards, you can be sure that you're learning from the BEST of the best. 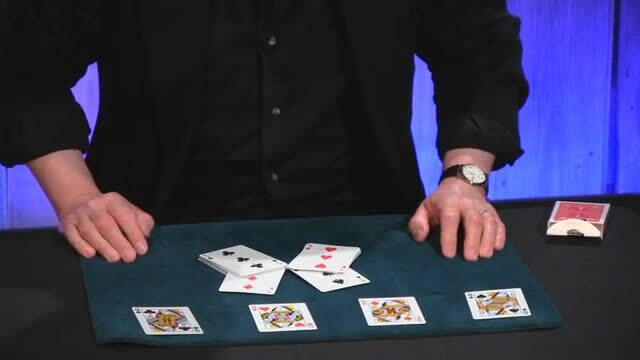 Now, in his all-new lecture for Penguin Live, Darwin has selected choice material from his book "Lessons in Card Mastery" that he will teach LIVE for the first time ever. If you've never been to a magic lecture, theres never been a better time. Sunday October 13th at 7:00pm, were live-streaming Darwin Ortiz in a spectacular 2-hour interactive online lecture. Watch, ask questions and learn things you won't find in any book or DVD. Purchase the Darwin Ortiz LIVE product. This is your ticket. 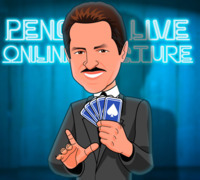 On Sunday October 13th, anytime before 7:00pm Eastern, click the MyPenguinMagic area at the top of the Penguin site. You'll see the livestream appear 1 hour before showtime. At 7pm sharp, Darwin will hit the stage and begin his JAM-PACKED professional lecture. Ask Darwin questions and discuss the tricks DURING the lecture. Check out our Darwin Ortiz LIVE Facebook page to post questions and discuss the event with us and your friends! Darwin Ortiz is an amazing technician, and a joy to watch work, but what he does in this lecture just isn't my style. For those who want to work with memorized decks, and tricky stacks, and precise card counting then this is the lecture for you. His work is 5 stars, my use for it is 3, so I averaged to 4. Just wanted to make it clear that my rating has nothing to do with his work or methods. the greatest card magicians on the planet. and made me reexamine my practice. There is stuff for people at all levels. Even though most of the tricks where Moderate to Advanced. There are techniques used in them tricks that can stand on there own that a beginner can use to push there trick to the next level. This is one lecture that I am more then happy to own. He also show a lot of audience management and how to get you audience to buy into the trick and not get board dealing out a full deck almost 2 full times. There may be a few things that he does not talk about. Not because he is avoiding anything, but because he does not want to spend hours explaining things the majority of people may not be interested in. Though he does tell you where you can find that information or at least what you are looking for. Buy this because Darwin is one of the best out there and you get to take a seat across from him. He's excellent and shows great confidence while performing. It's entertaining and interesting. Kidding aside, awesome lecture with a lot of material I will use! Darwin is awesome. Buy his books as well! Loads of great info from a true master. I've had the privilege to study his books first and then personally with Mr. Darwin Ortiz. If you're serious about your card magic, you can't go wrong with him. The lecture showcases many great and ingenious effects which will mentally destroy your audiences, mainly taken from Darwin's latest book "Lessons In Card Mastery". The explanations are filled with several psychological details and insights about audience management. Darwin doesn't always go into deep detail about every single technique involved (mainly things like faro shuffles, pinky counting, riffle stacking and so on) because, in that case, the lecture would have been twice as long! :-P Don't worry, though: there are many other great sources from which every card man can learn those techniques. 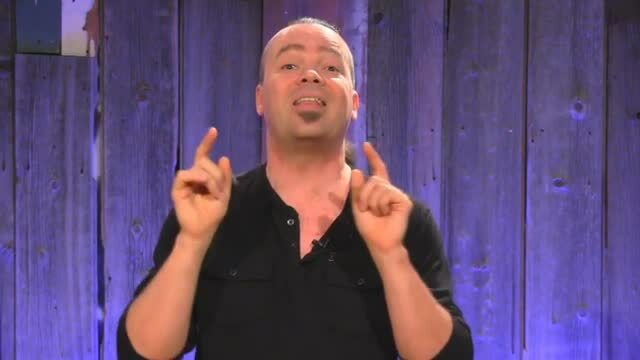 Overall, I would highly recommend this lecture to any serious student of card magic. Darwin's lecture was almost 4 hrs. in length and from the opening effect to the Q&A where he continued sharing "the real work", he had me baffled and entertained. A+ effects and teaching! One of the most inspiring lectures to date! I have been into magic for fourteen years (I am nineteen). Up until I was nine, I tried to learn all I could about everything to do with the subject. It was only at nine that I found card magic an interesting subject to solely focus on, and that is what I have done for the last ten years. It wasn't until I was fifteen that I picked up an old VHS called 'Cardshark'. Watching it I was amazed at the amount of good quality card magic that this 'Darwin Ortiz' was presenting. A few years later I bought his latest book 'Lessons in Card Mastery' and was again amazed at the amount of good quality card magic. I have made it an oath to not study any other magician unless they are Darwin Ortiz, his students (Michael Vincent, Jason Ladayne, Antonio Zuccarro), or his friends (David Roth, Jim Swain and Simon Aronson). I bought his first two (the hardest to get) books ('At the Card table' and 'Cardshark') before receiving the final magic book, 'Scams and Fantasies' on my eighteenth. Then I strived to get all of his other materials. That included his two theory books ('Strong Magic' and 'Designing Miracles', which I recommend buying), his ten DVD collection (which is on this website) and his lectures. I bought the International Magic ones and his 'At The Table' Live Lecture. This Penguin Live lecture was the last one I needed to buy and after buying it, I was not impressed. Just like all of his older material, Darwin Ortiz presents a wealth of good strong magic (all from 'Lessons In Card Mastery'). Even thought I knew every effect it was nice to see some subtleties and his presentation for the various effects. The question and answer parts on theory were also very inspiring and followed the trail of thought of his two theory books. One thing that I would say to criticise this lecture is that most of the material requires the use of difficult sleights (such as riffle stacking, strip-out shuffling, advanced work on the faro) but the effects presented should aspire everyone to pick up a resource on the subject and get learning. If they don't then they do not appreciate the usefulness of the sleights. In saying that, the difficult sleights appear in only one or two effects. Book Seven: Jim Swain's trilogy of books. DVD Ten: Aronson's DVD (that I have forgotten the name of). Ok, so it's not exactly ten books and ten DVD's, but the ten franchise books. As well, leave space for when they add to their collection. Hopefully Darwin will write a fifth book. This is an absolute must for serious card magicians. Darwin talks about great effects especially the ones for stacked decks. However there are 2 things that about this lecture. 1st thing is that you need to know how to do false riffle shuffles as Darwin uses it a lot in this lecture. 2nd thing is that Darwin messes up during explanations a few times and for one effect he doesn't explain how to get the cards to position. Therefore, I feel this is best if you have somewhat of an advanced skill with cards. But overall it is a great lecture and absolutely worth the money. Darwin Ortiz is the man. Great performance, great stuff. The teaching was horrible. During explanations can the tricks go wrong, but not every trick. It looked like he wasnt prepared for the explanations.